Can Tho (VNA) – Policy and technological solutions in support of enterprises which are either agricultural start-ups or shifting their operation to agri-business were discussed at an APEC forum in the Mekong Delta city of Can Tho on August 23. 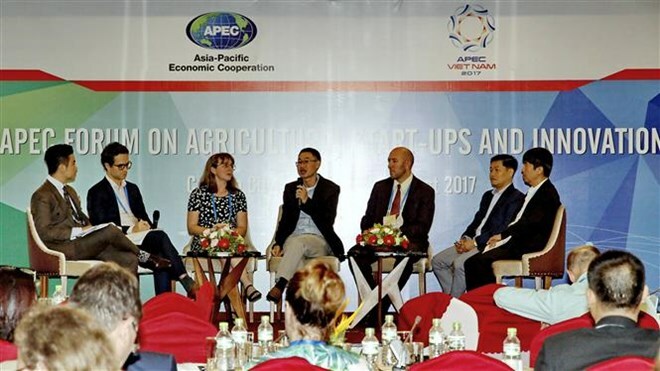 The APEC Forum on Agricultural Start-ups and Innovation brought together businesspeople, investors and officials in the agricultural sector of member economies of the Asia-Pacific Economic Cooperation (APEC). The event is expected to stimulate efficient collaboration and partnerships between public and private sectors in APEC economies, and to promote agricultural investment capabilities by providing right incentives for agricultural start-ups and innovations in the region, thereby transitioning towards a regional ecosystem of ICT-enabled knowledge economies. The APEC economies are facing significant challenges in increasing agricultural production to meet the diversified food demands of increasing population, at the same time, improving the sustainable use of natural resources for future generations, the forum heard. Agricultural start-ups in the region have been constrained by limited market access capabilities, investment opportunities and partnerships to expand their business operation. Speaking to reporters, Tri Nguyen, co-founder and CEO of MimosaTEK, a startup that provides farm management solutions for both smallholder farmers and large agricultural companies in different parts of Vietnam and for different crops, underlined the important role of technology in agriculture. Start-ups should take into consideration difficulties in terms of the market, and especially how to change awareness of farmers about technological applications in agriculture, he said. Start-ups can join hands with big enterprises and organisations to reform the farming sector, he said, noting that a strong start-up ecosystem, which includes incubators, investors, supportive organisations and big companies specialising in agriculture, can help start-ups gain successes. Godefroy Grosjean, from the International Centre for Tropical Agriculture, stressed the need to create a favourable environment for the agricultural sector to promote innovation, which means providing sufficient finance for start-ups and ensuring their intellectual property.